After a long day of playing outside in the sun and heat, an ice-cold popsicle can really hit the spot. You can make your own and turn it into a fun activity for you and your kids! The fun thing about making homemade popsicles is that you can really try whatever you’d like. Get creative with fruits, juices, yogurt, candies, and more. 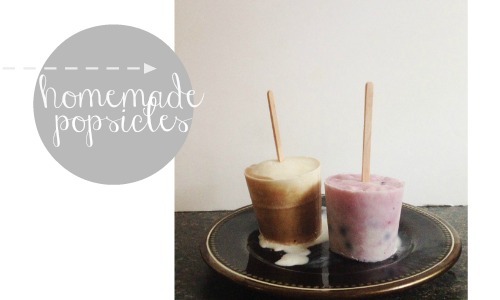 Here are two recipes that I created: root beer float popsicles and blueberry yogurt popsicles. Tip: I used disposable paper cups for my mold, but if you have the old-school plastic molds or even the fancier popsicle-making machines, those will work, too. To make the root beer float popsicles, allow 1/4 cup of the ice cream to soften a little and add it to the bottom of a disposable paper cup. Gently tap the cup to remove any air bubbles. Place in the freezer and allow to harden. Once the ice cream is frozen, slowly pour the root beer over the ice cream. Allow the bubbles to fade and place back into the freezer and allow to harden. Once the root beer is frozen, allow the remaining 1/4 cup ice cream to soften and gently spread it over the top of the root beer. Gently tap the cup to remove any air bubbles. At this point you can insert the popsicle stick straight down into the middle of the mixture. Place in freezer and allow to completely harden. To make the blueberry yogurt popsicles, stir the blueberries and honey together in a bowl until well combined. Fold in the greek yogurt until the mixture looks swirled. 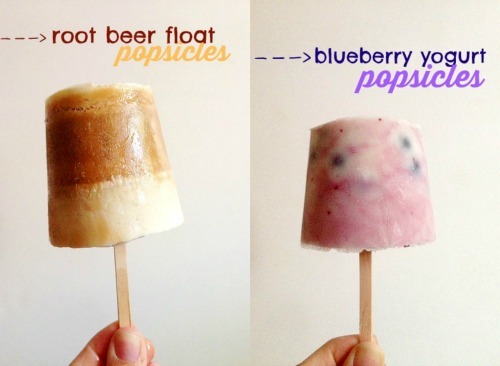 Add it to a disposable paper cup and insert a popsicle stick straight down into the middle. Place in freezer and allow to completely harden. 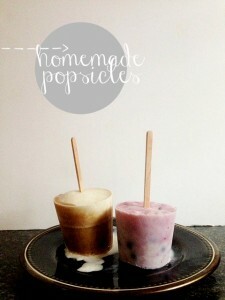 To remove the popsicles from the cup, cut a small slit on the top of the cup and gently tear it away from the popsicle. These recipes make one popsicle each, but you can easily multiply them.